A Los Angeles City Hall memorial planned for the late superstar Prince will feature a roster of popular R&B singers, city officials said Thursday evening. Among those slated to take part in the free concert are Prince collaborators, The Time, as well as Faith Evans, Kenny Lattimore, Eric Benet and Aloe Blacc, City Councilmember Marqueece Harris-Dawson said in a statement. The concert is scheduled to run Friday from 5 p.m. to 8 p.m. on City Hall’s South Lawn, and it will likely tie up traffic for downtown commuters. Residents are being urged to take Metro to the Grand Park/Civic Center station. Spring Street between Temple and First will be closed starting at 8 a.m. in preparation for the event, traffic officials said. The street will re-open after 9 p.m.
A flyer tied to the event lists the hosts as Mayor Eric Garcetti, and Los Angeles City councilmembers Marqueece Harris-Dawson, Jose Huizar and Curren Price. City officials have not said what the event will cost. “We don’t have a final budget yet,” said Carl Marziali, press secretary for Garcetti, in a statement. 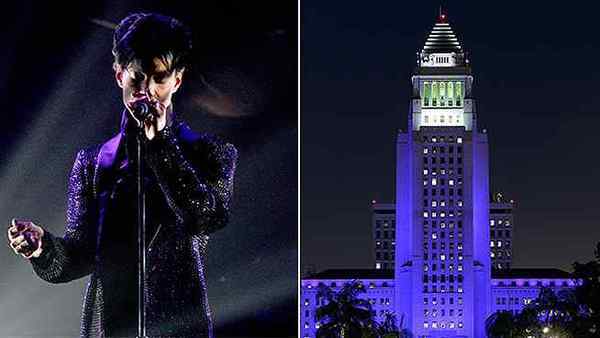 His passing prompted L.A. officials to illuminate City Hall, where the musician’s “Diamonds and Pearls” music video was shot, in purple lights. Garcetti also called the singer a “once-in-a-generation talent” in a statement after his death.